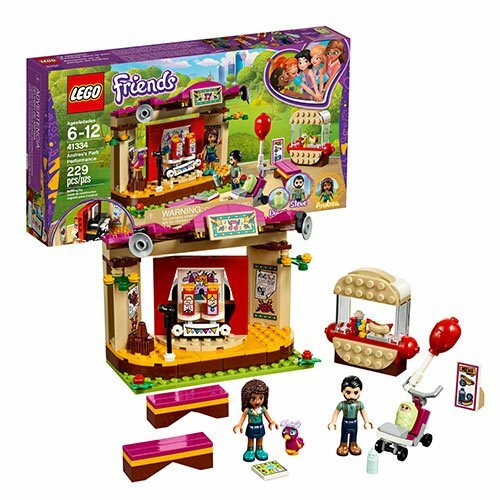 This LEGO Friends Andrea's Park Performance toy for girls and boys includes a stage with 2 different sets. Put on a puppet show with moving puppet function or rotate the stage background to give a musical performance featuring a piano with moving keys. There are park benches for the audience and a hot dog stand selling food and water. Includes 2 mini-doll figures, plus a baby and a bird figure. The LEGO Friends 41334 Andrea's Park Performance includes 229 pieces. Ages 6 and up.